Both of NASA’s Voyager spacecraft are now interstellar. Launched in 1977, the twin probes will likely outlive the sun. Find out what star systems they’ll meet as they head deeper into the galaxy. NASA’s twin Voyager spacecraft have been traveling the interstellar road for more than 40 years, sweeping past the giant planets of the outer solar system before heading to the very fringes of our sun’s domain. Now, one probe has achieved a milestone in exploration: On December 10, NASA announced that Voyager 2 has entered interstellar space, six years after Voyager 1 first crossed the threshold. The twins are the only two spacecraft ever to venture so far from home. To confirm Voyager 2’s exit, scientists analyzed data from the spacecraft’s Plasma Science Experiment, which measured the heliopause—the boundary between the sun’s protective plasma bubble and interstellar space. On November 5, the instrument recorded a steep decline in particles from the sun’s plasma. At the same time, Voyager 2 saw more high-energy particles from elsewhere in the galaxy, confirming that the probe had left our cosmic cul-de-sac. SEE TWO SPACECRAFT JOURNEY TO OUTER REACHES OF SOLAR SYSTEM. The two Voyager spacecraft have explored the giant planets of our solar system, and are now heading for the stars. 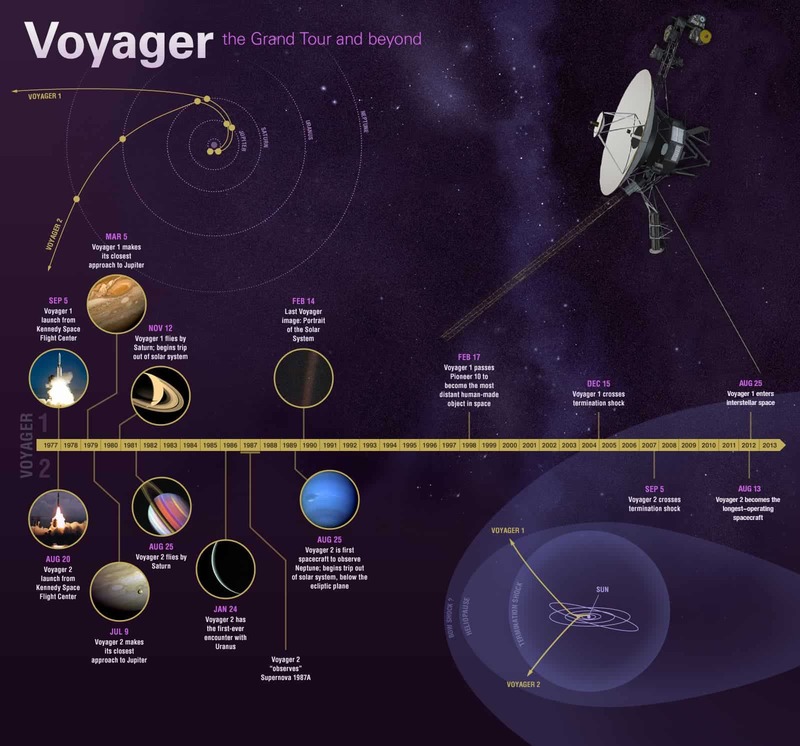 But even at more than 11 billion miles from the sun, the Voyagers’ story is just beginning. On their current paths, both probes will still be heading outward across the galaxy eons after they escape the gravitational tug of the sun, and perhaps long after our star dies in four or five billion years. Should the spacecraft ever be intercepted by an alien civilization, two golden records bearing the sights and sounds of planet Earth could play the last whispers of a long-dead planet. Assuming they stay on course, it’s going to be a lonely trip for the Voyagers, because even though our Earthly skies appear to glitter with countless pinpricks of light, space is mostly empty. Distances between the stars are so vast that even when our galaxy smashes into the one next door, not much will happen in the way of stellar collisions. Still, according to astronomers’ predictions, their cosmic treks will bring the Voyagers close to several starry milestones and a dust cloud or three over the next hundred thousand or so years. Here are some of the known cosmic landmarks the Voyagers could meet in their relatively near futures. Launched from Cape Canaveral, Florida, on August 20, 1977, the dairy cow-size Voyager 2 began its odyssey with a grand tour of the outer solar system, making vital discoveries at Jupiter and Saturn and returning some of the best views yet of Uranus and Neptune. The probe is now dipping below the plane of the solar system at roughly 34,500 miles an hour and heading celestially south, toward the constellation Sagittarius. On November 5, 2018, it crossed the heliopause, exiting the sun’s protective plasma bubble. Voyager 2 may be freshly interstellar, but it won’t be anywhere near another star until 40,000 years from now, when it will pass within 1.7 light-years of the small red dwarf star Ross 248. At that point, Ross 248 will be the closest star to our sun, briefly eclipsing the Alpha Centauri system’s claim to fame as its path through the galaxy brings it just 3.02 light-years away. 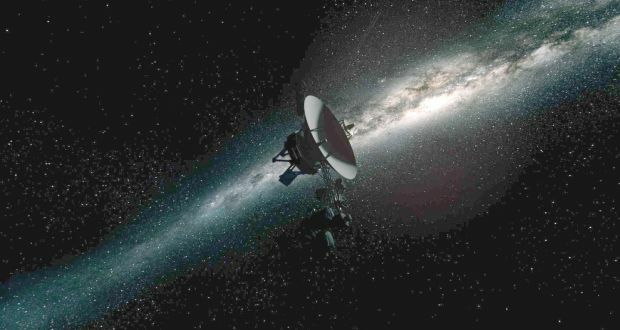 About 61,000 years from now, Voyager 2 will pass beyond the Oort Cloud—a large, diffuse swarm of icy objects that is thought to extend as far as 200,000 times farther from the sun than Earth, says Wesleyan University’s Seth Redfield. Voyager 2 may be freshly interstellar, but it won’t be anywhere near another star until 40,000 years from now. Most scientists think the Oort cloud is the source of comets that take thousands of years to complete one orbit around the sun. It could also be the true boundary of the solar system, if you consider that to be the point where the sun’s gravitational influence drops off. “The outer edge of the Oort Cloud is approximately where that is,” says Redfield, who has used the Hubble Space Telescope to study the Voyagers’ paths in detail for the next hundred thousand years, and more crudely for the next several million. Next, in the year 298,000 Voyager 2 will swing within about four light-years of Sirius, the brightest star in Earth’s sky. It’ll then brush by two stars, delta Pav and GJ 754, about a hundred thousand years later. Voyager 1 followed its twin into the sky on September 5, 1977. It rendezvoused with Jupiter and Saturn in 1979 and 1980, returning some spectacular views of volcanoes erupting on the Jovian moon Io, then continued outward. On February 14, 1990, it swiveled to capture the solar system retreating from its view, including a series of images that revealed our pale blue planet looking like “a mote of dust suspended in a sunbeam,” according to Carl Sagan. Now traveling more than 35,000 miles an hour in the direction of the constellation Ophiuchus, Voyager 1 is the fastest human-made object in space. In 2013, it became the first spacecraft to leave the heliosphere and cross into interstellar space. In the year 40,272, the spacecraft will sail within 1.7 light-years of the star Gliese 445in the constellation Camelopardalis. In 56,000 years, Voyager 1 will exit the Oort cloud, then brush by the stars GJ 686 and GJ 678 in 570,000 years. Beyond that, both spacecraft will continue on their journeys outward, passing through scattered dust clouds on their way through the local bubble, a cavern of relatively empty space blown by tempestuous dying stars. They’ll exit this bubble in 5.7 and 6.3 million years, respectively. From there, things get murky. The peculiar motions of stars and dust clouds orbiting the galactic center aren’t well known yet, and the spacecraft could be slowed by sailing through dust clouds. Plus, gravitational encounters with things like wandering, starless planets could bounce the probes around like billiard balls. Ultimately, like the stars in the Milky Way, the Voyagers will march to the galaxy’s tune and orbit its core for the rest of their lives. That might occur in four billion years, when the neighboring Andromeda galaxy smashes into the Milky Way and rearranges our skies in spectacular ways. How the Voyagers’ ultimate demise occurs—whether it’s death by a thousand micrometeorite impacts, or one large improbable collision—remains a mystery. It’s even possible the Voyagers will outlive the solar system, surviving long after the sun’s death sculpts our neighborhood into a dramatically different place.